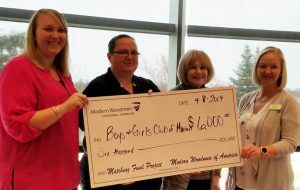 The WBC was so very honored to present Maggie Breeding (left, in red) of the Boys and Girls Club of Marion County with a check for $6,000. The Boys and Girls Club was the chosen charity of Major Christy Utley (second from left), our 2019 Athena Award recipient. $6,000!!! Woo Hoo!!! Isn’t that awesome! Of that, $3,500 was raised by the Silent Auction at the Athena event … thank you so very much to everyone who donated items, time and effort … and all those who bid and purchased a basket. $2,500 was a donation match by Modern Woodmen of America … thank you so much for your ongoing support of the Athena event. Join the members of Marion Women’s Business Council for a luncheon featuring a special $500 charity opportunity. The event will be held Monday, May 13, 2019 from 11:30 a.m. – 1:00 p.m. in The Guthery Room at Maynard Hall on the OSUM-MTC Campus, 1461 Mt. Vernon Avenue. At each table, attendees will have two minutes to tell about their favorite local charity and why they believe that non-profit is the most deserving. WBC members at each table will then vote and submit a nomination into the overall drawing. Once all tables have submitted their nomination, a nonprofit will randomly be selected as the recipient of a $500 donation from Marion Women’s Business Council. A woman who has dedicated her life to helping people recover from drug addiction is the 2016 recipient of the Athena Award. 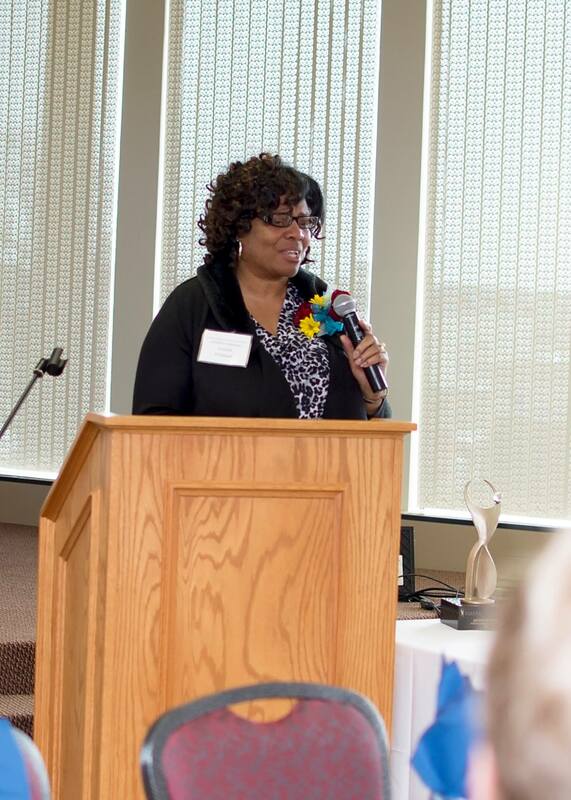 Arnita Pittman, founder and executive director of the Arnita Pittman Community Recovery Center/Buckeye Residential Housing, was honored by the Marion Women’s Business Council during the annual Athena Luncheon on Monday. She is the 19th recipient of the award in Marion County. Read more on this year’s winner in the Marion Star – click here! Join the members of Marion Women’s Business Council for a luncheon and special charity opportunity! The event will be Monday, April 11, 2016 from 11:30am – 1:00 pm on the second floor of META Solutions (formerly TRECA) at 100 Executive Dr. in Marion. Women’s Business Council members will nominate their favorite charity at the luncheon. At each round table, attendees will have 2 minutes to tell about their charity and why they believe their charity should receive everyone’s vote. Each table of attendees will bring forward one charity from their table that they feel is most deserving and submit that charity’s name into a basket. Once all tables have voted, a name will be selected from the basket as the recipient of a $500 donation from Women’s Business Council. Lunch catered by All Occasions will be available for $13 with your RSVP by April 6th, 2016. You may RSVP by sending an email to mrn.wbc@gmail.com or by calling Elaine Evans, Membership Chair, at 740-389-9960 ext. 307. Women’s Business Council luncheons will be held the second Monday of each month September through May. Interested in joining? Visit www.WomensBusinessCouncil.com for a membership application and a complete program schedule. Check back often for announcements and special events!